**This product is made to order. Please allow 10-14 days for shipping. The Tuckable High-Ride Quick, Click & Carry holsters are custom made to order. These are custom made to order and and are not eligible for exchange or return so please ensure correct sizing when ordering. The Tuckable High-Ride Quick, Click & Carry Holster was designed at the request of our customers. Our customers loved the comfort and convenience of the Original Quick, Click, & Carry however desired more of a shooters grip when wearing jeans/belts and tucked in shirts. 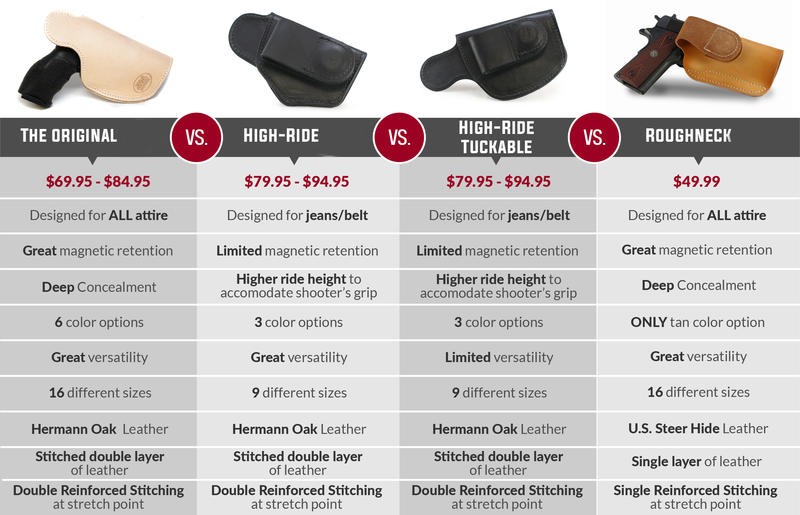 The Tuckable High-Ride Quick, Click & Carry is our direct response to your request and is designed for the more business dressed individuals that require tucked in shirts. The Tuckable High-Ride Quick, Click & Carry allows you to be armed and prepared without the hassle of clips that damage your clothing. The Tuckable High-Ride does have magnetic retention but it has been reduced due to the placement of the magnets to acquire the higher ride of this holster. However the magnetic pull force remains the same as the Original Quick, Click, & Carry holster when evaluating the attachment to the waistline. The downfall of this holster is that you lose some of the versatility that the other Quick, Click & Carry holsters possess. Made with Hermann Oak Grade A Vegetable Tanned Steer Hide that's Ph balanced for gun contact, you will never need to worry about the damage to the bluing of your firearm. The black and brown holsters do start as Hermann Oak Grade A Vegetable Tanned Steer Hide and are hand dyed with high grade dyes. To keep the comfort of the soft leather we do not apply a sealant to the black or brown holsters and they do have the possibility of slight bleeding onto skin or clothing the first couple times of use but will wash out. With the exception of the original large ALL of our Quick, Click, & Carry holsters come standard with a sweat guard. These are more pronouced with the sizes above the large. Please refer to generated image once you have selected your size, color (if applicaple), and hand. The image will be the specified item you are purchasing. *We do offer a 10 day money back guarantee so buy with confidence. I have had my holster for a week now and loving it. Extremely comfortable and will be buying a few more. I purchased this holster in February 2018. It was my first holster. I wasn't sure about how to carry but decided to go with appendix. The holster is very comfortable and I can wear it all day with out any issues. It took a bit of practice to tuck my shirt with out looking strange, but l finally got and the weapon isn't noticeable; the magnet doesn't show much either. I originally ordered the natural but after receiving it decided to go with the brown; for me it was a lot lighter than I had expected. Customer service was great to work with and provided what I needed to return. I had my new holster with about 10 days of returning. Very pleased with the holster and the staff. I had the opportunity to meet the owner and his staff at the USCCA convention this year and they are all top notch and very customer oriented. This product is so comfortable and have no complaints. I’m 260lbs. with a XDMS45 with a laser. Fits right and tucked in my shorts. I’m in Vegas with a 115 degree weather and still comfortable. I have never worn an IWB, because they are uncomfortable and bulky. After purchasing this holster, I wear my weapon all the time. This holster is very comfortable and small. The High Ride fits me perfectly as I am a short person. I have already recommended this holster to my friends. I have 5 holsters from JM4 and all of them are amazing and very comfortable . Thier customer service is also spectacular and very accommodating! I ordered the 1911 4-4.5 high ride tuckable for my Super Carry Pro and fits great and it tucks very well. I am very happy with it I just wonder how an Original would do if it was tuckable. these holsters are very well built I can see getting years of use out of them. I am so happy with the holster! Fits nicely and doesn’t move around like a belt holster. Snug fit on any out I wear.